Rosa banksiae 'Alba Plena' or the Double-white Banksian Rose is a fast growing, climbing shrub with long, slender smooth stems and small, pale green leaves. Clusters of double, rosette-like, violet-scented white flowers are produced from late spring into summer. 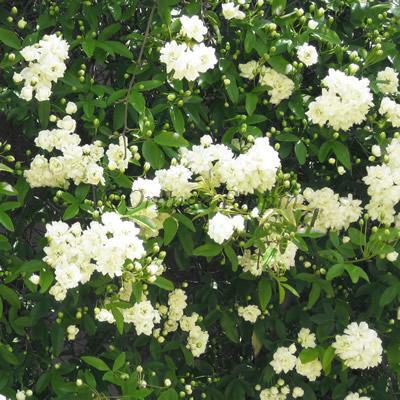 This quick growing, non-evergreen climber is best trained on a wall, fence or trellis in a sheltered, but sunny position, protected from frosts and cold drying winds. It is perfect for the city, cottage, informal style garden and can also be used for flower arranging.